Think of the enjoyment tasting all your favorite beers to choose the best one for this recipe! TO PREPARE THE GOOSE LEGS: Slice off any loose pieces of skin. Season the legs on all sides with salt and pepper, and dredge with flour, shaking off any excess. In a pan just large enough accommodate the 4 goose legs, heat the vegetable oil over medium heat. Add the bacon strips and sauté until browned. Remove bacon strips with slotted spoon and reserve. Add the seasoned goose legs and brown on all sides. Add the onions and simmer until onions are translucent, about 4 minutes. Add garlic, thyme and beer, enough beer to cover the legs. Bring to a boil. Cover and simmer until the legs are tender, about 35 - 40 minutes. Cooking times will vary depending on size of goose legs. Test for doneness with a fork, meat should be tender and juices will be clear. Remove from heat, taste broth and adjust seasonings. TO PREPARE THE SPÄTZLE: Place the flour in a large mixing bowl with the salt, nutmeg, pepper and parsley. Break the eggs into a small bowl and beat well with a fork. Gradually pour the eggs into the flour, mixing thoroughly with your hand or a flexible rubber spatula. Add the water a little at a time and mix until the dough no longer adheres to the sides of the bowl. The dough should be rather firm, the consistency of a thick batter. Bring 2 quarts of water with 2 tablespoons of salt to a rapid boil. Cover the pot of water with a spätzle maker or a colander with large holes (1/4 to 3/8 inch in diameter) Force the dough through the holes with the rubber spatula. Use about one-third of the dough at a time. Allow the spätzle to cook until they rise to the surface, about 3 to 5 minutes. Using a slotted spoon, transfer the cooked spätzle into a large bowl of cold water. Repeat until all the dough is used. To serve, thoroughly drain the spätzle in a colander. Melt the butter in a skillet. When the butter begins to brown, add the spätzle and sauté for 1 to 2 minutes until hot. Season with salt and pepper. TO SERVE: Place one goose leg on each warmed plate. Spoon 2 - 3 tablespoons broth over each leg. 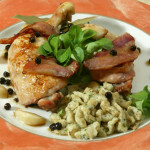 Scatter 1/4 blueberries on to plates and arrange a bacon strip over each goose leg. 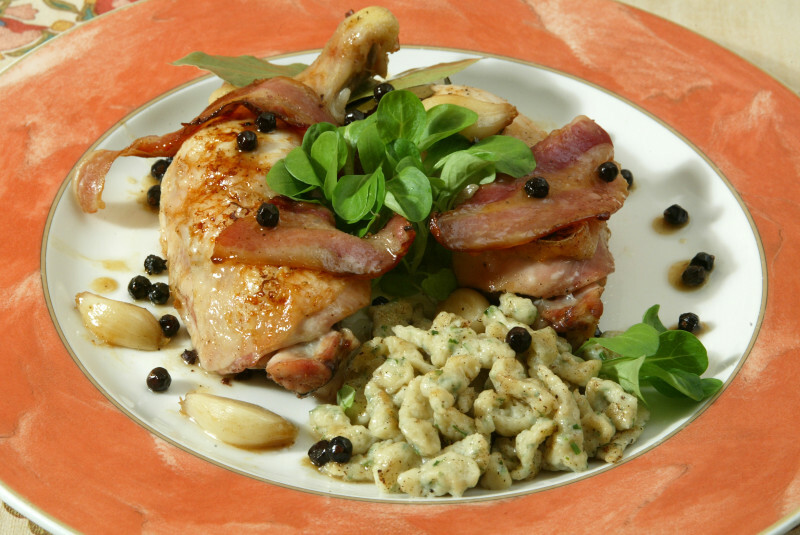 Serve with rice or spätzle.